For our exploration of The Notion of Family, several Politics for the People members have chosen a photo from the book to respond to with thoughts, words, a photo or a poem. Josephine Coskie, a member from Long Island kicks off this series with her thoughts on Grandma Ruby and Me. Grandmothers are the keepers of tradition. The 2005 photo of Grandma Ruby sitting on the floor of her living room with the author inspired me to recall fondly the memory of my grandmother. My family lived in a back apartment of the Brooklyn home of my grandparents. My father, a World War II veteran, was the oldest of five children born to my Italian immigrant grandfather and Brooklyn Irish grandmother. As the oldest of three children living in that household, I would help my grandmother get the dining room table ready for our traditional Sunday dinners. Memories and activities of childhood stay with us. I realize now that my enjoyment of setting a lovely table originated back then in the 1950’s. After dinner, my visiting aunts and uncles would play several games of poker and I would play my grandmother’s “hand” whenever she went into the kitchen to get more food for the table. My grandmother loved the holidays and always had a live, tall Christmas tree decorated with old-fashioned ornaments. I recall painstakingly hanging tinsel piece by piece on the numerous branches. At midnight on New Years Eve, she would open the front living room window and bang an old frying pan with a spoon, then go downstairs, open the front door, and “sweep out the old year” with a broom. She would speak of the old days when there were gaslights along the streets. I was fascinated by her history lessons and my interest in old New York continues to this day. Frequently, we would travel together to the downtown Brooklyn shopping area, stop for lunch in the dining room of a large department store, and finish the day at Howard Johnson sitting at the counter, enjoying ice cream sodas. The time spent with my grandmother enriched my life as I believe it was the same experience for Latoya Ruby Frazier. I am grateful this photo helped me relive those wonderful childhood memories of her. 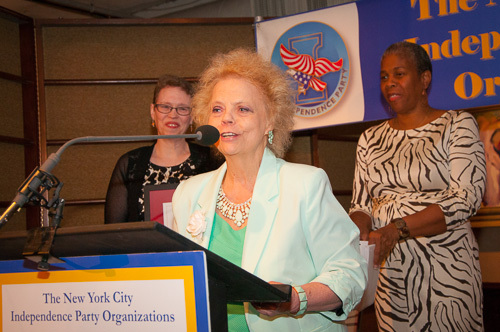 Josephine Coskie is an independent activist and was the 2013 recipient of the Nicholas S. Johnson Independent Spirit Award given by the NYC Independence clubs to recognize outstanding volunteers.